No one arriving in Australia as a refugee or seeking asylum will be fully vaccinated according to the Australian immunisation schedule. This is due to differences in country of origin schedules, and/or issues with health service access. 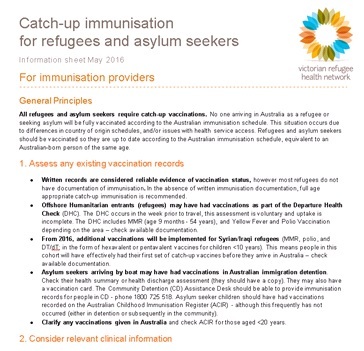 Refugees and asylum seekers should be vaccinated so they are up to date according to the Australian immunisation schedule, equivalent to an Australian-born person of the same age. This information sheet has been prepared for GPs and other immunisation providers. It provides clinical advice, links to resources, and information about the impact of recent immunisation policy changes on families from refugee backgrounds.